To me, Vietnam has always been exotic and far away. I’ve seen stunning photos and heard incredible travel tales but I have not had the pleasure of visiting ... yet. Well, my brother, his wife and my sweet niece and nephews moved to Hanoi last week and will be living there for two years. Amazing! I’m excited to hear about their adventures and eventually to visit them and share some Vietnamese experiences with them. Of course, I am also thinking of the food! I’m looking forward to Vietnamese cooking and need to get a good book (any recommendations?). 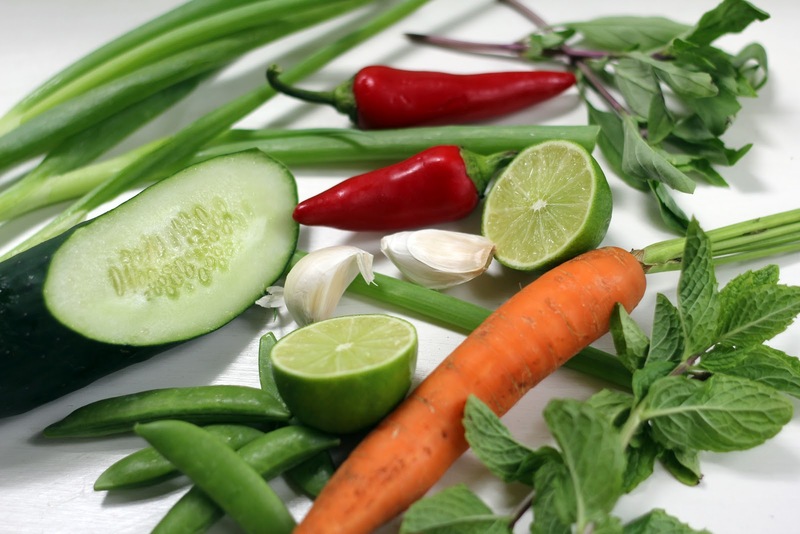 When I think of Vietnamese food I’ve eaten in restaurants, fresh herbs, vibrant flavors and spicy heat come to mind. Plates piled high with basil, mint, cilantro and lettuce accompany the dishes I order. My taste buds tingle as I inhale the fragrances and begin eating. In honor of Tim and Kristen departing with their family, I started chopping and tasting to create a Vietnamese noodle salad in my own kitchen. 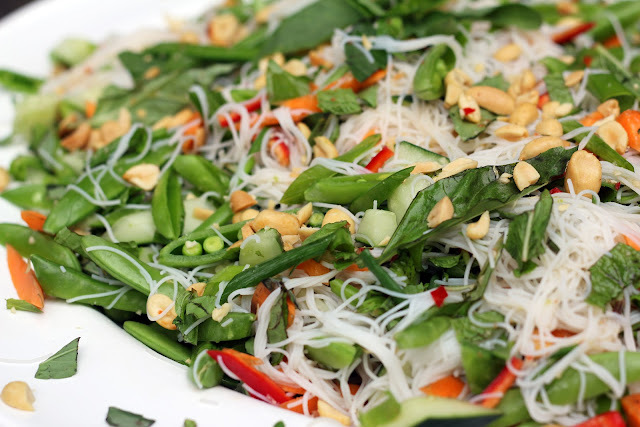 Fresh herbs were foremost on my mind, along with soft rice noodles and crisp vegetables. Vietnamese cooking evokes tastes of sweet, sour, salty and spicy. To achieve this balance, I squeezed limes, chopped garlic, minced chili peppers and crumbled brown sugar. 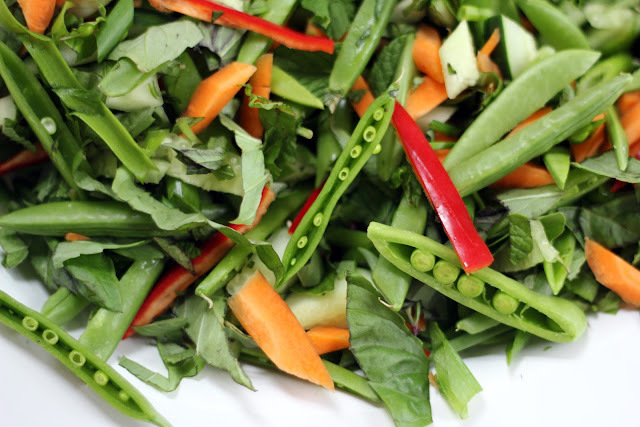 Fish sauce added a depth of flavor – umami if you will – that pulled the dressing together. The salad became a tangled, pretty web of bright flavors, gentle heat and crunchy textures. We eagerly ate bowls of the salad while discussing the first photos and tidbits from Tim’s new life. I wish them a wonderful, delicious time in Hanoi! Bring a large pan of water to a boil, immerse the rice noodles in it and let them sit for 10 minutes. Drain the noodles when they are soft and rinse in cool water. 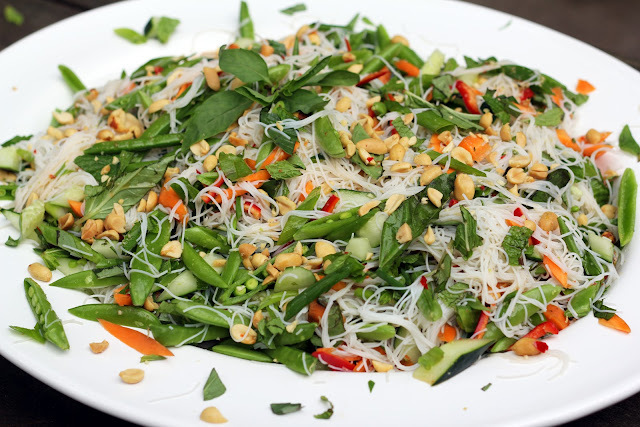 On a large platter or in a large bowl, combine the remaining salad ingredients (reserve some peanuts to garnish) and mix in the rice noodles. I used my hands since bits kept flying off my platter. In a food processor, combine all of the dressing ingredients and whiz until smooth. Pour half of the dressing over the salad and gently toss to mix in. Add the remaining dressing slowly and to taste. Sprinkle the reserved peanuts over and serve. It is time to start my own stash of infused liqueurs. I have been intrigued by the variety of fresh new cocktails I see on menus and read about in magazines; liqueurs steeped in cucumber, mint, citrus and berries. How fun to have a selection of homemade concoctions to choose from when mixing up a drink! I can wait no longer. I jumped in and learned that the process is really quite simple - chop up your chosen fruit, herb and/or spice, plop it all into a jar of vodka and forget about it for two to three weeks. Admittedly it is late in the season for rhubarb. Inspiration struck me when I had some rhubarb stalks languishing in my fridge and I began pondering what to make with them. A plump vanilla bean made its way into the mix, as well. While simple syrup is often added for some sweetness, I substituted a small amount of agave syrup with success. 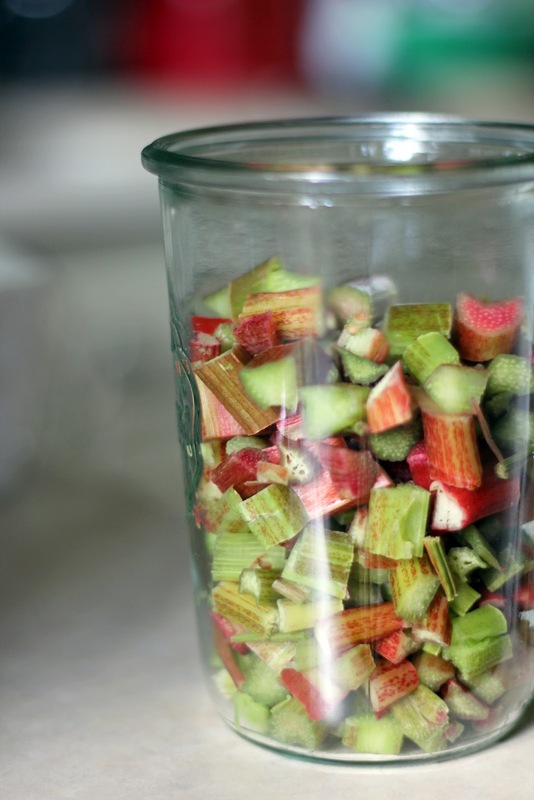 If you froze rhubarb or still have access to some stalks then I recommend throwing this all together and waiting patiently. The clear vodka becomes a rosy red as the color seeps out of the rhubarb. 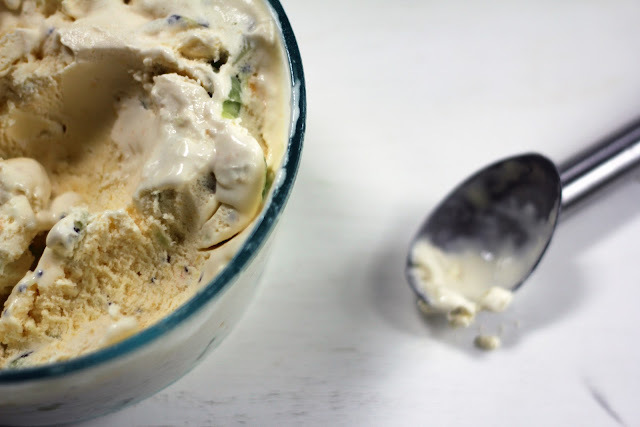 Tiny black specks of vanilla bean dot the surface and a fruity, vanilla scent escapes each time I open the jar, evoking rhubarb cobbler for me. I grabbed a couple of pretty cocktail glasses and headed outside where I proudly poured into each a splash of the first liqueur in my soon-to-grow stash. I topped them off with sparkling wine (any excuse for bubbles!). I'm on my way, sipping in the backyard on a warm summer evening, contemplating the next infusion. 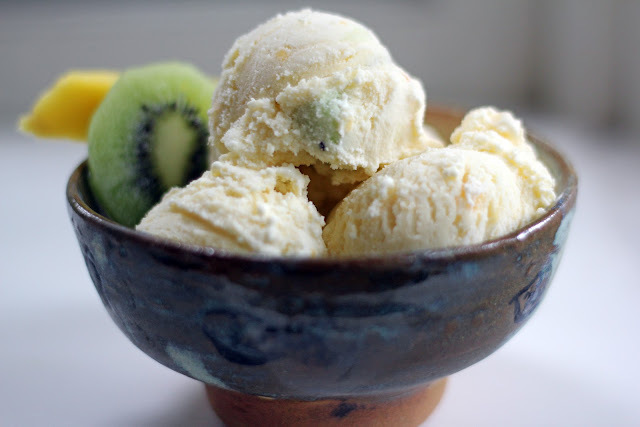 In a large jar, muddle all of the ingredients together with the handle of a wooden spoon. Cover and place in a room temperature spot. Let the mixture sit for two to three weeks (mine infused for three weeks since I was out of town). Strain over a sieve and discard the solids. Store the liqueur at room temperature. Chocolate cherry bourbon shortcake ... I meant to take only a little bite to taste how the flavors came together. And then another, just to be sure. And then before I knew it, the plate was empty. Now I’m sighing in delight and can’t even think about dinner. Strawberry shortcake is my favorite summer dessert, followed closely by Pavlova – any excuse to pair fruit and cream! My son, Isaac, chose strawberry shortcake for the dessert at his Bar Mitzvah Shabbat dinner ... it’s a family favorite. So when I saw that Abby Dodge selected shortcake for this month’s Bake Together challenge I was a bit gleeful. Normally I am traditional in my shortcake and bake a cream scone as the base for luscious cream and juicy berries. Abby shares her chocolate shortcake, though, and I decided to try something new, adding a dash of ground espresso for more depth of flavor. My small counter space was taken up with a flat of raspberries, so I scooped the dough out rather than rolling and cutting it. The resulting shortcakes were quite rustic with craggy tops that I rather liked. I haven’t cooked or baked nearly enough with cherries yet this season so I continued to branch out in my shortcake adventure and use cherries in place of berries. I seem to have misplaced my cherry pitter, but fortunately my friend Ashley shared her handy tip to pit with a chopstick – just give the cherry a poke and the pit bursts out. 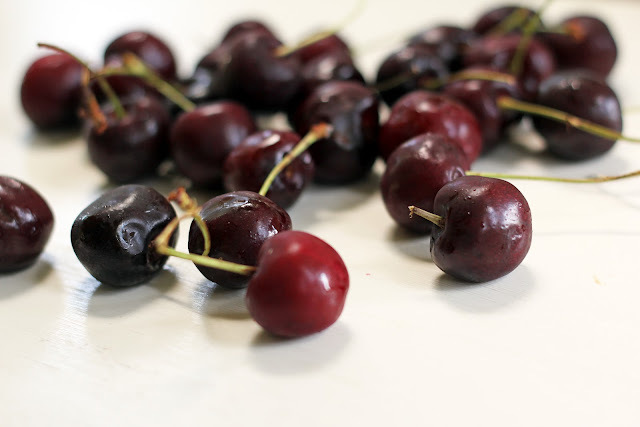 Now, pitting cherries is a tedious and messy process but if you can embrace the stained fingers and inevitable splatters you will be happily rewarded. I listened to Ladi6 and grooved a bit and two pounds of cherries were pitted before I knew it. 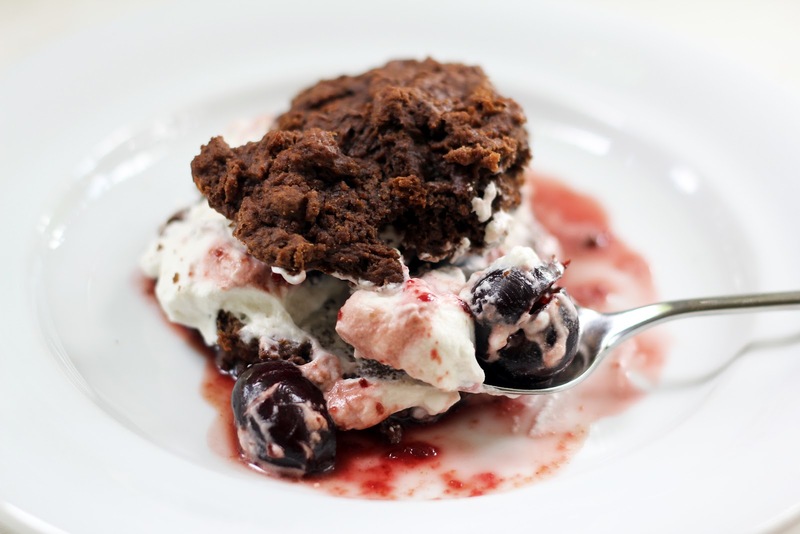 I didn’t stop there – cherries lend themselves well to booze and chocolate so I spiked the whipped cream with bourbon and sweetened it with brown sugar (I love bourbon as an added flavor and in cocktails ... I promise to share a smashing cocktail later this summer). What a combination of flavors and textures! 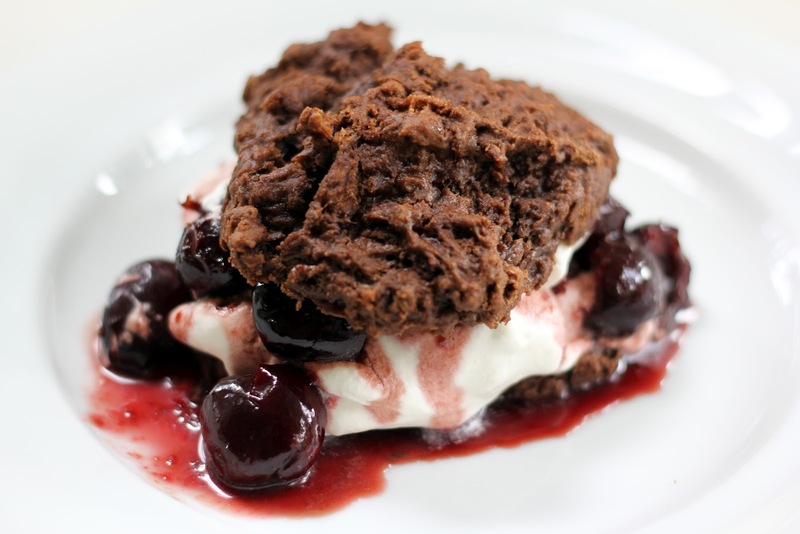 The dark sweetness of cherries and chocolate combined with billowy cream is rich and sublime, soft and tender. I will happily make this shortcake again. Preheat the oven to 400°F. Line a baking sheet with parchment or a nonstick liner. Cut the butter into small pieces and place in the freezer until ready to use. Whisk the buttermilk and vanilla together and pop in the refrigerator until ready to use. 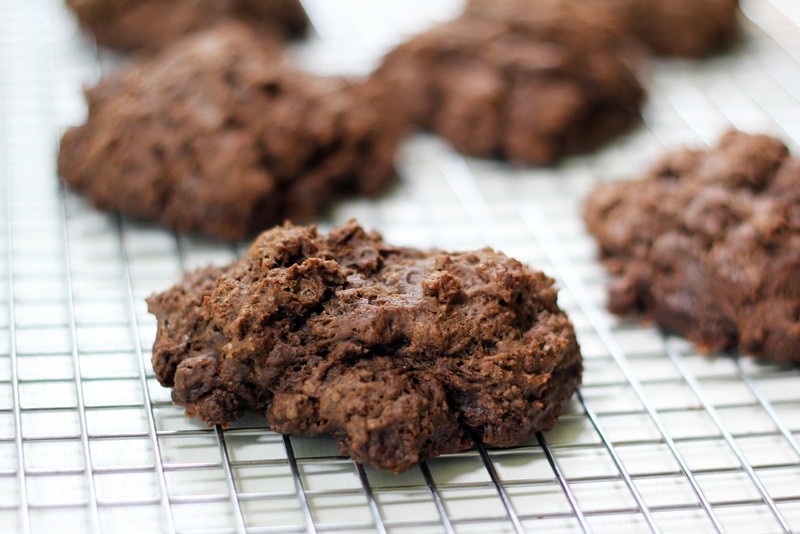 Put the flour, sugar, cocoa, espresso powder, baking powder, baking soda, and salt in a food processor and pulse until well blended. Add the cold butter pieces and, using short pulses, cut the butter into the flour until the mixture resembles coarse meal, about 1 minute. Scrape the mixture into a large bowl and pour the buttermilk and vanilla over the flour mixture. Use a rubber spatula to stir until it forms a moist dough and holds together (do not mix too much). Divide the dough into 8 portions and drop onto the prepared baking sheet. Bake until puffed and spring back when the tops are gently pressed, about 12 minutes. Let the shortcakes cool for about 15 minutes. Serve warm or at room temperature. 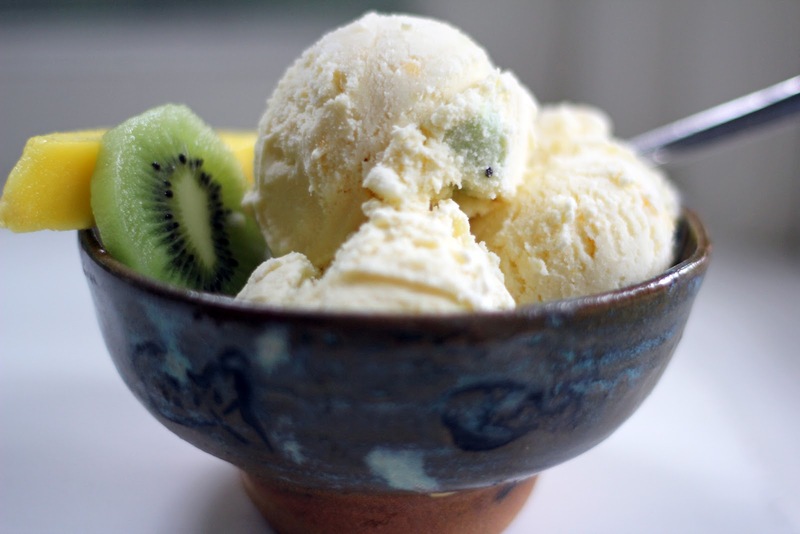 In a medium bowl, beat the chilled cream until soft peaks begin to form. Add the bourbon, brown sugar and vanilla and beat until mixed in. Serve immediately or cover and chill for a few hours. Pit the cherries using a cherry pitter or chopstick. 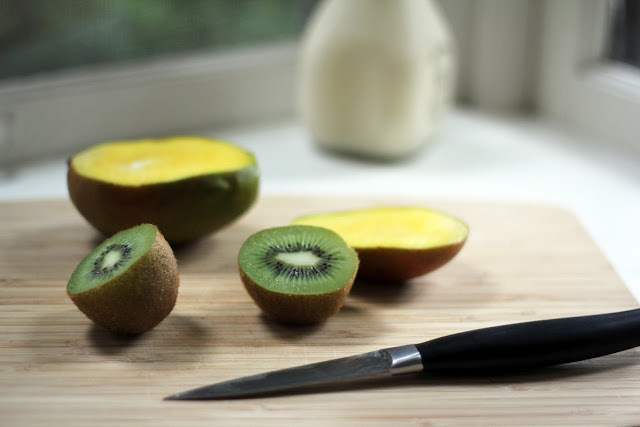 In a bowl, stir the sugar and cherries together and then mash with a pastry cutter to start juicing and breaking the fruit down (you may also discover a pit or two that slipped by). Cover the bowl and refrigerate for a few hours until the cherries have released some of their juices. Using a serrated knife, cut the shortcakes in half crosswise and place the bottom halves on serving plates. Spoon big dollops of whipped cream onto the bottom halves, ladle some cherries and their juices over, add a little more whipped cream because it’s so good, and cover with the top half of the shortcake. Serve immediately. Before I jump into pickles, I just want to say how grateful I am for the caring, supportive words shared in response to my last post. I am fortunate to be part of such a kind, gracious community. Thank you. This Friday begins the annual Can-a-Rama weekend. 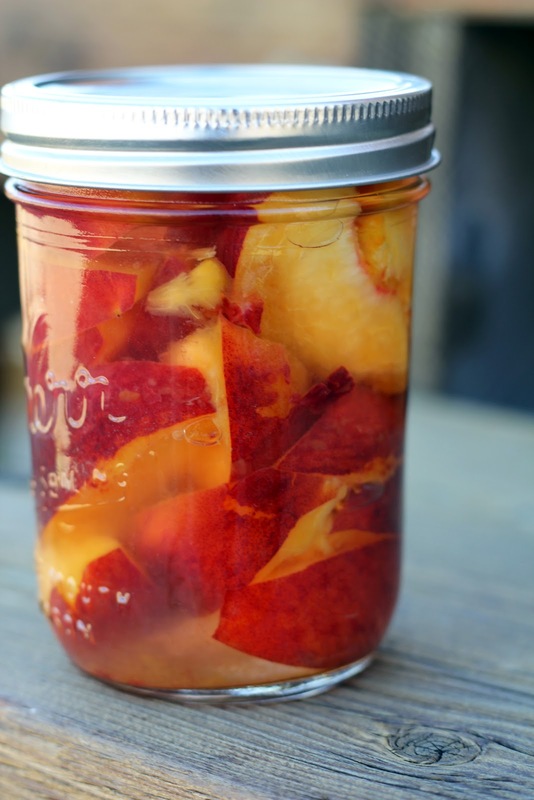 What a terrific time to start preserving your garden or farmers’ market bounty. Seeing tiny leaves unfurl and stems grow tall thrills me. I’ve decided the scent of tomato leaves is one of the best fragrances ever and would happily bottle it if I could. We are huge fans of anything pickled. My taste buds tingle just thinking about pickles! 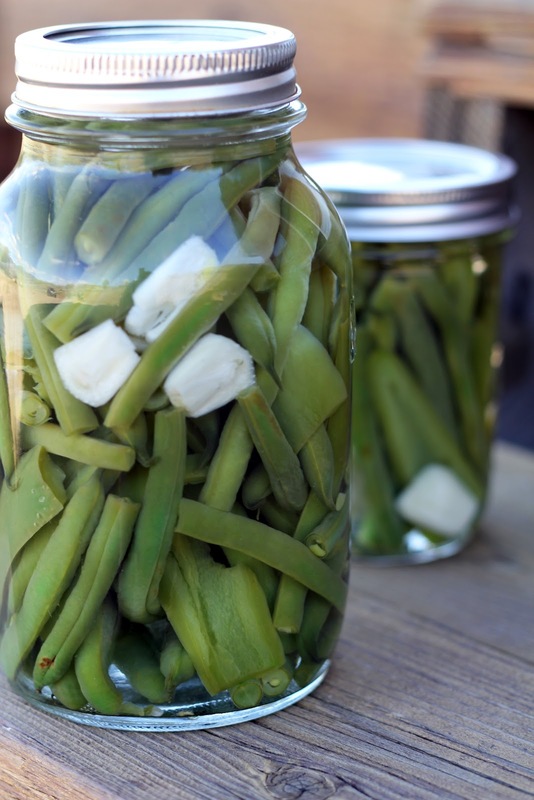 Last summer I pickled carrots, tomatillos and green beans. I felt a surge of pride each time I opened the fridge! This summer I chose to ramp up the spice and pickle green beans and jalapenos together. 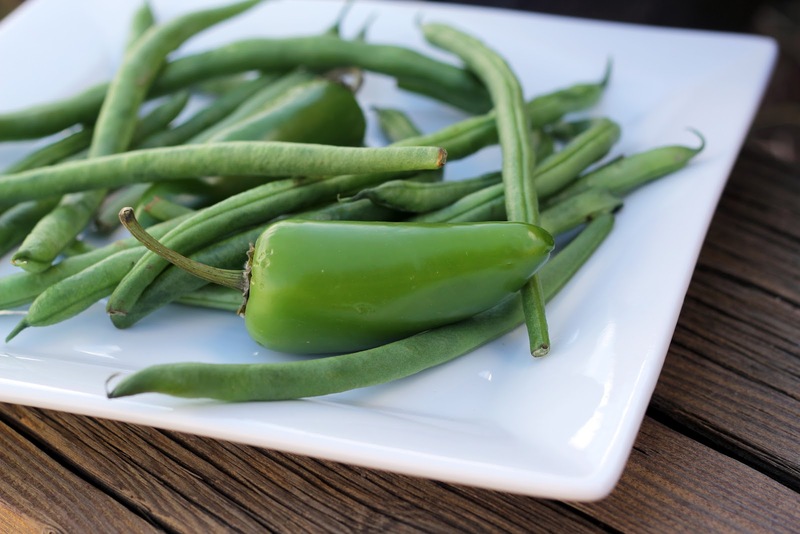 A gentle heat infused the fresh green beans, making them a tasty and addictive afternoon nibble. The jalapenos were fiery and left a pleasant buzz in my mouth. They added a warm flavor to the radish-goat cheese-pickled onion baguette sandwiches I made for Bob and Sam’s fly-fishing adventure with our friend, Greg. (Sam is learning fly-fishing this summer as his senior project ... how cool is that?). On a whim, I sliced two peaches and covered them with the leftover brine overnight. 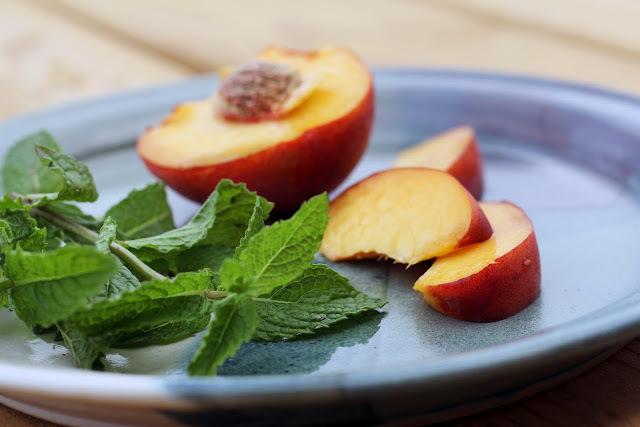 The sweet-salty peaches were delicious when added to a salad, and the fruity brine made a unique vinaigrette when whisked with olive oil. Happy pickling! P.S. Just saw Moonrise Kingdom and love this sweet summer movie. Have ready a clean, sterilized 1 quart and 1 pint jar. Fill a large saucepan with water and bring to a boil. Add the green beans and jalapenos and blanch them for 2 minutes. Drain the pot. Divide the green beans, jalapenos and garlic slices between the jars. For the brine, combine the vinegar, water, salt and sugar in the same large saucepan. Bring to a boil and stir until the sugar dissolves. Let boil for 2 minutes. Remove from the heat. 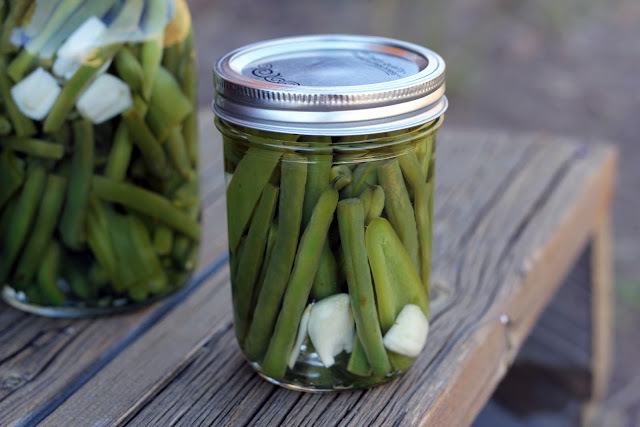 Carefully fill the jars with the brine to within 1/2 inch of the top of the rim, covering the vegetables completely. Discard any leftover brine. 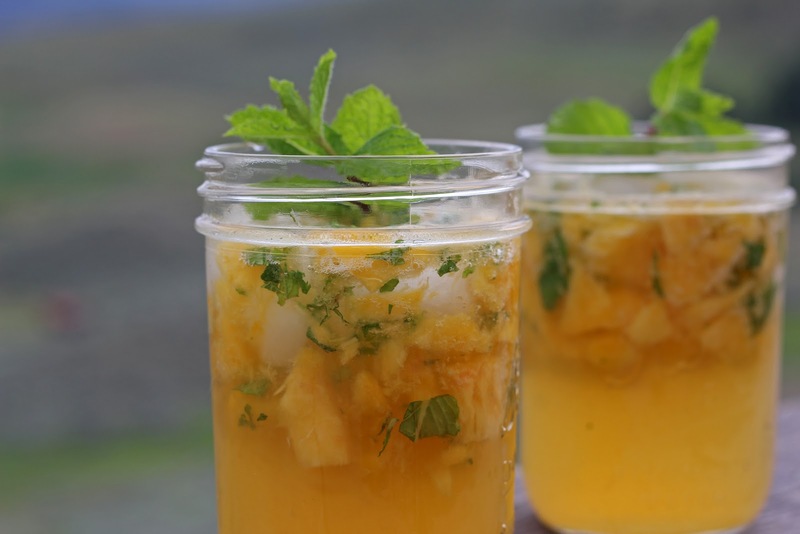 Place lids on the jars and refrigerate for at least 24 hours before serving. Pickles will keep in the refrigerator for up to 1 month. Over time, the heat of the jalapenos will mellow. My heart is heavy. I had prepared something different for today, but tragic circumstances are keeping me from sharing it. I will come back to that recipe at a later time, but when I read over what I had written it did not fit my frame of mind at all. In this past month, I have lost two friends to untimely deaths. Both people leave behind beautiful young families. One death, quite sudden last week, has left our community in a state of shock. This past week has been a blur as I am reminded of how quickly life can change. Sometimes (hopefully most of the time) the change is sweet and wonderful and easy to celebrate. When the change is a devastating one, we lean on each other and grieve together. One of the many ways we support and nurture each other, especially in times of sorrow, is through the food we prepare. Food comforts and sustains. In Judaism, traditional foods to eat during mourning are eggs, bread and lentils. They symbolize the cycle of life and life itself. 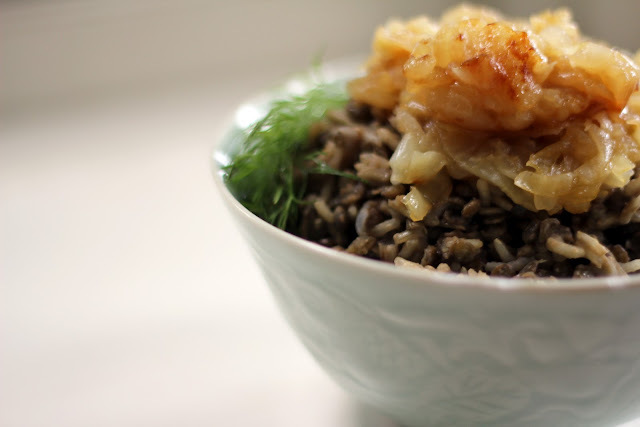 Mujaddara is a Middle Eastern dish made with humble ingredients, lentils and rice. 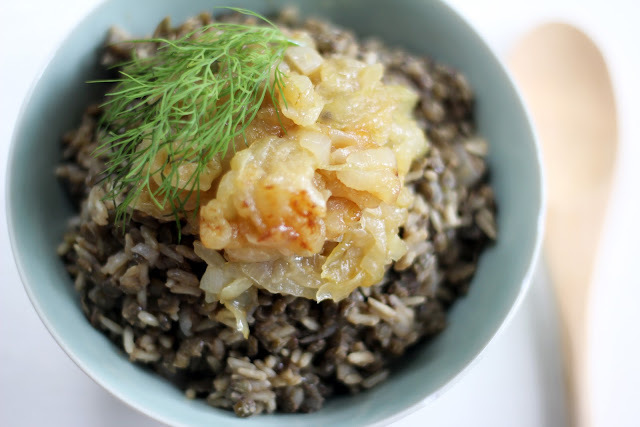 The lentils and rice are cooked together with caramelized onions to create a bowl of soft, soothing goodness. If desired, cumin, coriander, dill or mint can be added, as can a dollop of thick yogurt. I chose to season the mujaddara simply this time, with just salt and pepper. We say that we never know what life will bring, and it really is true. I am grateful to be part of this kind, caring community, knowing that we will take care of and strengthen each other no matter what comes. In a large frying pan, heat the olive oil over medium high heat. Add the sliced onions and 1 teaspoon salt. Stir and cook the onions until they soften, then lower the heat and continue cooking until golden brown, about half an hour. Rinse the lentils and place them in a large pot with the 5 cups of water and 2 teaspoons of salt. 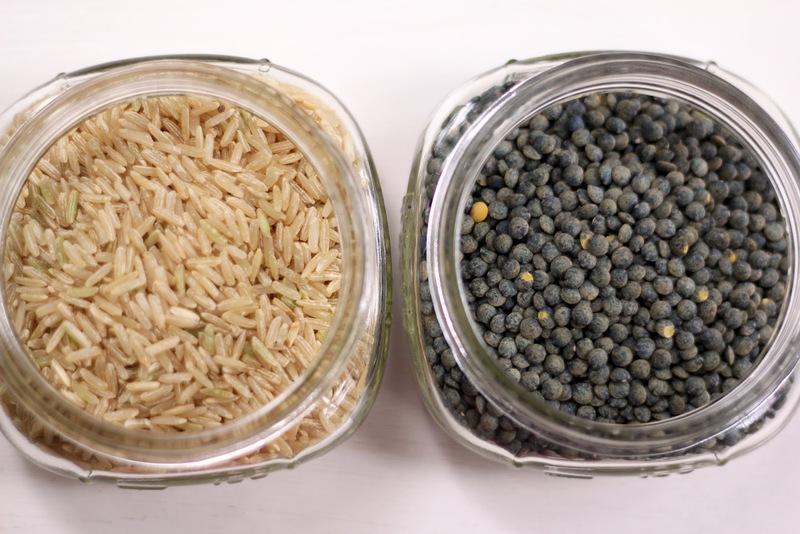 Bring to a boil, then lower heat and simmer for about 10-15 minutes, until the lentils are soft but still have a bite. Stir in the rice and half of the caramelized onions. Cover and simmer until the rice is soft, about 20 minutes. Season to taste with a few grinds of black pepper and additional salt. Serve topped with the remaining half of caramelized onions and a dollop of yogurt, if desired. We had quite a fun time celebrating the July 4th holiday, complete with a small town parade, superhero-themed arts and crafts, music, good food and friends at a local park. The sun, blue skies and festive spirit have me in the mood for a breezy cocktail. Earlier this week, I discovered the first beautiful, juicy peaches of the season. Yes! This also means it’s Peach Dumplings time, always a top favorite. We happily indulged this week. Now, I love cocktails that include fresh fruit, and what with a couple of peaches left over from dumpling-making, well ... you know where my thoughts wandered. My husband loves both peaches and mint, so with Bob in mind I was inspired to combine them and create a fun and refreshing drink. 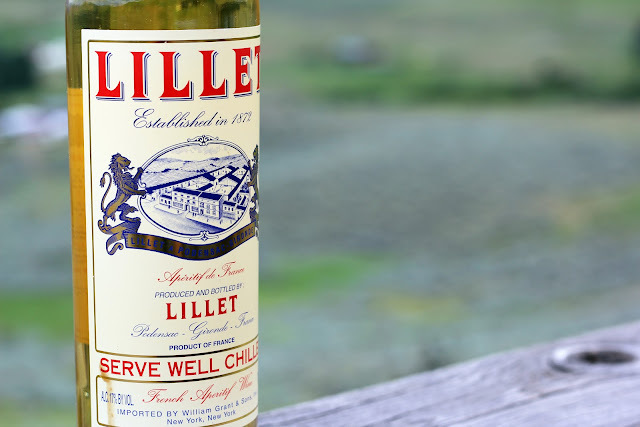 A bottle of Lillet beckoned from the fridge. I like the slightly floral, citrus flavor of this aperitif and thought it would pair well with the bright fruitiness of peaches and mint. A squeeze of lime and dash of club soda finished the cooler off. 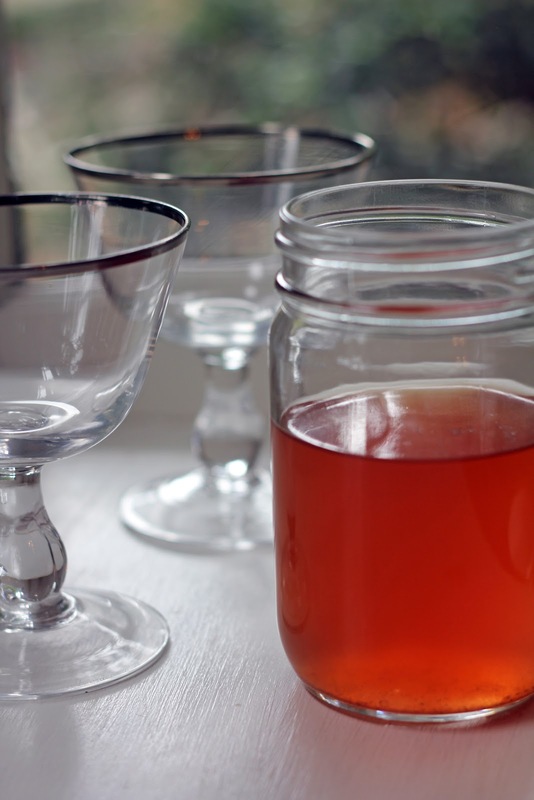 Light, a little bit sweet, this is perfect to sip on warm, lazy evening. Cheers! 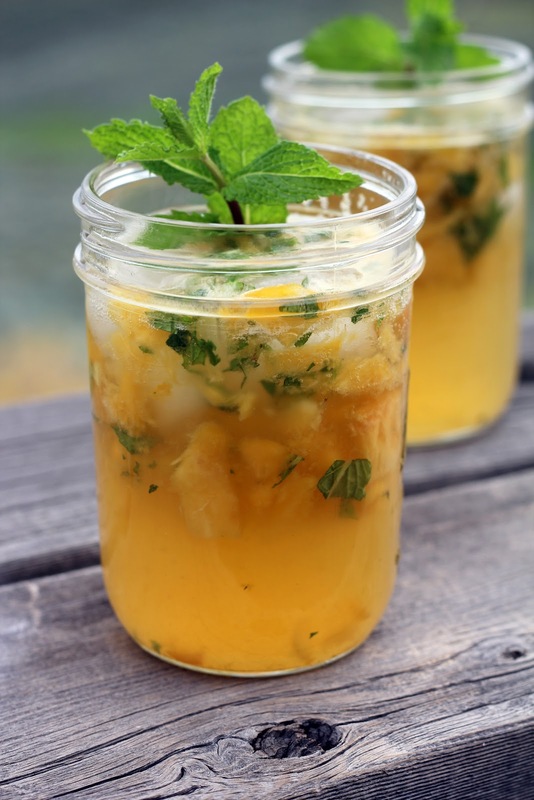 In a bowl, combine the peaches, mint and honey and muddle with the handle of a wooden spoon. Leave to macerate for 15 minutes or so. Pull out 4 pretty cocktail glasses or Mason jars. Add 1 tablespoon lime juice to each, followed by 2 ounces of Lillet each. 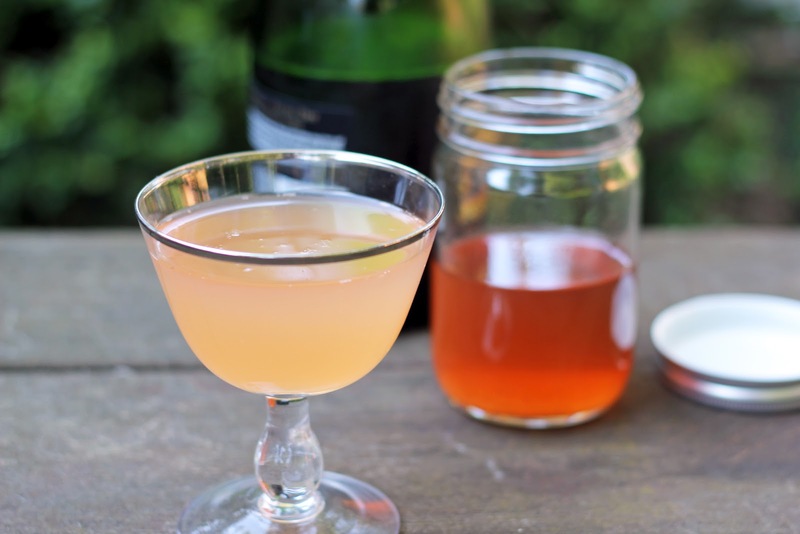 Divide the peach mixture evenly between the glasses. Stir to mix. Add a few ice cubes to each and top off with club soda. Garnish with mint leaves. Clink your glasses and start sipping.